Streets and neighbourhoods of interest within the City of Victoria include Beacon Hill Park, Chinatown, Government Street and the Inner Harbour. Other notable areas in the downtown area include Bastion Square, Market Square, Douglas Street, Blanchard Street, Fort Street and Rockland Avenue. Neighbourhoods of special significance for locals and tourists alike just minutes away but outside the municipality’s technical “city limits” include Oak Bay and Gordon Head. Other main roads of significant importance are the Pat Bay Highway which connects Victoria with Swartz Bay and the BC Ferry Terminal, and the Trans-Canada Highway which connects Victoria with the rest of Vancouver Island. For information on the above parts of town in Victoria, see below. For information about other municipalities within the larger region, including Colwood, Esquimalt, Saanich, Sooke, Sidney and other communities, click Great Victoria. The Inner Harbour is the beautiful waterfront area in the heart of downtown Victoria where the Empress Hotel and Legislative Buildings are located. For more information on what is arguably Victoria’s most famous part of town, click Victoria’s Inner Harbour. 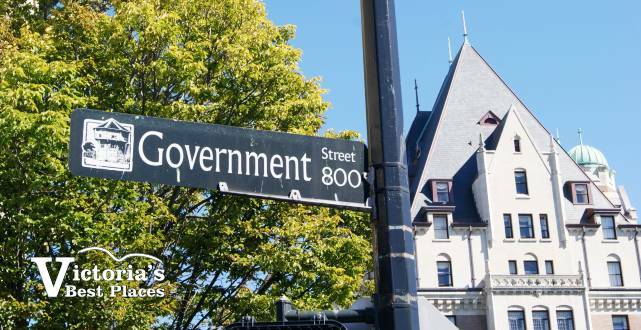 Government Street is a trendy road that intersects the Inner Harbour and where you’ll find the Empress Hotel, Bay Centre, Victoria’s Mountain Equipment Coop store, the MacPherson Playhouse, and numerous other trendy stores, souvenir shops and restaurants. Also on Government Street are the main entrance ways to both Bastion Square and Chinatown, and not far away is Market Square. Bastion Square is a short pedestrian street and civic square located between Wharf Street near the waterfront and Government Street by the Bay Centre. It’s full of old heritage buildings, outdoor patio restaurants (in the warmer season) and the Bastion Square Public Market which takes place on Thursdays, Fridays, Saturdays and Sundays in the summer. Market Square is another historic square in downtown Victoria located in the block bordered by Pandora Street, Store Street and Johnston Street half a block from the Mountain Equipment Coop store and a couple of blocks from Chinatown. There isn’t usually a lot to see other than an empty square surrounded by a number of restaurants and interesting stores, but Market Square and the entire neighbourhood around it is where you’ll find some of Victoria’s oldest and most beautiful heritage buildings. The oldest Chinatown in Canada and today a National Historic Site, Victoria’s Chinatown is centred along Fisgard Street and the area between Government Street, Store Street, Herald Street and Pandora Avenue. It’s a small area full of historic buildings, Asian stores and Chinese restaurants. Places of interest there include the entrance gate and Fan Tan Alley. Douglas Street is Victoria’s main commercial street which leads into the Trans-Canada Highway. 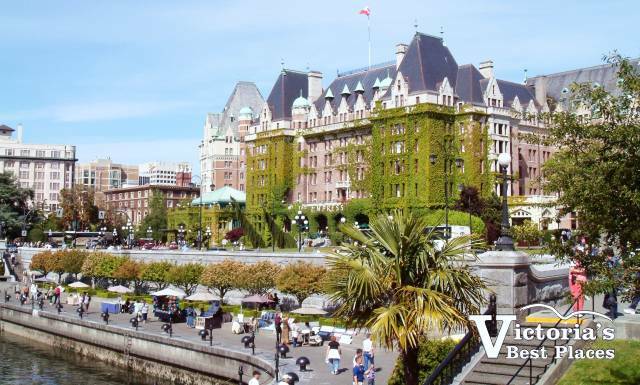 In the heart of downtown it’s where you’ll find Victoria City Hall, the back side of the Empress Hotel, the Bay Centre shopping mall, the Victoria Convention Centre, and numerous shops, banks, hotels and restaurants. At the one end Douglas forms the western edge of Beacon Hill Park and as it heads out of town it’s where you’ll find Mayfair Shopping Centre. Next to Douglas Street, Blanchard is arguably Victoria’s second most important commercial street. As it exits Victoria it turns into the Patricia Bay Highway which connects the city with BC’s Lower Mainland via Swartz Bay and the BC Ferries network. Along the Blanchard Street part of the road is the Save-on-Foods Memorial Centre (civic arena), Mayfair Mall, Uptown Market shopping centre and Victoria’s Royal Theatre, not to mention lots of shops, restaurants and commercial buildings. Fort Street is a commercial street in downtown Victoria that intersects many of Victoria’s other main commercial streets, including Government, Douglas, Blanchard, Quadra and Cook. What’s particularly special about Fort Street is its collection of antique stores, coin and stamp shops, heritage buildings and auction houses. 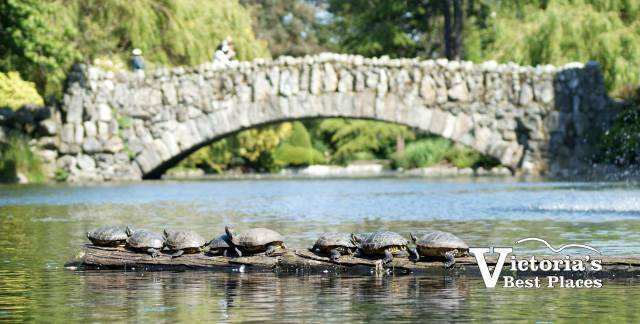 Beacon Hill Park is Victoria’s large, free, beautiful and world-famous city park. It stretches from the edge of the downtown core all the way to Dallas Road and the ocean. At Beacon Hill Park there are tranquil ponds, beautiful gardens, rugged beaches, miles of walking trails, a petty zoo, sports fields, tennis courts, a cricket pitch, large children’s playground, outdoor bandstand and lots of trees, plants, flowers, ducks, squirrels and everything else you can imagine in a first-rate urban park. Rockland Avenue is a quiet street and upscale residential neighbourhood. It’s not large or long, but it is beautiful to drive or walk along. Places of interest along the way include the Lieutenant Governor’s House at 1401 Rockland Avenue and Craigdarroch Castle just a few blocks away at 1050 Joan Crescent. Oak Bay isn’t actually within the City of Victoria – it’s its own municipality, but still part of Greater Victoria. We include mention of it here as it borders the City of Victoria and its neighbourhoods are often included in tourist bus tours. Areas of particular interest in Oak Bay include Beach Drive which connects with Victoria’s Dallas Road to make a spectacularly scenic drive along the southern shore of the peninsula. Points of interest along the route include Ross Bay and the Ross Bay Cemetery (both still within the City of Victoria), Gonzales Bay (at the border of the two municipalities) and the Victoria Golf Club, Willows Beach and Cattle Point. Also in the municipality of Oak Bay is charming Oak Bay Village and the ritzy residential neighbourhood of Uplands. Like Oak Bay, Gordon Head isn’t actually within the City of Victoria. Unlike Oak Bay, however, it’s not its own municipality – it’s part of the municipality of Saanich. Saanich is a large municipality, both by land mass and population. It borders both Victoria and Oak Bay. The University of Victoria in fact is half in Oak Bay and half in the Saanich neighbourhood of Gordon Head. Mount Doug Park is also in Gordon Head and boasts some of the finest views of the region, much like Mount Tolmie which is also in Saanich but not Gordon Head. As mentioned above, Douglas Street turns into the Trans-Canada Highway which connects Victoria with the rest of Vancouver Island. Points of interest along the #1 Highway but still within Greater Victoria include Thetis Lake Regional Park and Goldstream Provincial Park. Also as mentioned above, Blanchard Street turns into the Pat Bay Highway and connects the region with the Swartz Bay Ferry Terminal. Along the way, points of interest include Elk Lake and Beaver Lake within the municipality of Saanich. The Pat Bay Highway also leads to the turnoff for Brentwood Bay, home to world-famous Butchart Gardens as well as nearby Butterfly Gardens. The Pat Bay Highway also connects Victoria with Victoria International Airport and the municipality of Sidney. 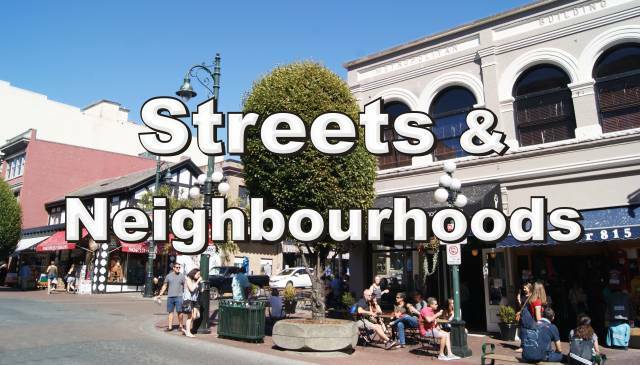 The above is just a short list of some of the City of Victoria’s main streets and neighbourhoods. There is a whole lot more to the region, though, including many attractions in all the other municipalities that make up Greater Victoria. For a more complete list of what’s what and worth seeing in British Columbia’s capital city and the surround area, click the A’s to Z’s of Victoria. For a list of neighbourhoods and other municipalities close by and their own various attractions, including regional highlights like world-famous Butchart Gardens, click Greater Victoria.